John and I have been in our new home for 10 months now, and we’ve done quite a bit since move-in day last October (see all of the before and after photos and stories here). But one thing that had yet to be addressed on my to-do list was the front door. Truth be told, we don’t actually have a “true” front door—just a glass storm door off to the side that leads into our bricked out sun porch. But since this side door is the only one that faces the street, I’ve been aching to give it a little more appeal of the “curb” variety. The big problem? Budget, of course! In my research for a new mid-century style exterior door, I kept coming up with options that cost somewhere in the $400-$500 zone, which is definitely outside the realm of our possibilities at the moment. So, instead, I decided to make do with our inherited storm door by redressing it in brand new window film care of Astek Home. The frosted aqua-colored film that I chose was less than half the cost of a new front door, and was a lot less of a hassle, too. Below, I’m sharing the full how-to, plus the pretty wild before and after photos! Clean your glass storm door thoroughly with a microfiber towel and a mixture of 1 teaspoon baby shampoo and 1 gallon bottled water. It’s important that you use no-tears baby shampoo and bottled water to provide the correct pH level for this project. Never use any cleaner containing vinegar or ammonia to clean the film or glass, as this could damage the product. Use measuring tape to measure the dimensions of your storm door, adding an extra inch on both the height and width measurements. 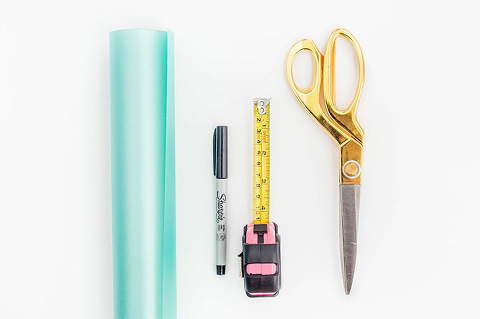 Unroll the window film on a flat surface, and mark your measurements with a marker. Cut the film to size using a pair of scissors. Remove the storm door from the frame, and lay it flat on the ground or on a sawhorse stand. Spray the inside of the storm door (this will be the side you lay the film on) liberally with the same solution you used to clean the glass. Keep your hands moistened with the solution to prevent leaving fingerprints on the film. Carefully peel off the plastic backing paper of the window film, and spray the exposed sticky side of the film with solution. TIP: You can lightly spray your hands to keep them from sticking to the film, too. Starting at the top, place the adhesive side of the film on the glass and work your way down the window. Position the film so that it’s centered on the glass and spray it with the solution. Squeegee any bubbles to within two inches of the edge of the window. Keep the surface of the film wet with the solution so the squeegee will pull across it easily. Use a sharp utility knife to trim the film to size along the edges of your door. You can sandwich the knife between a ruler (or straight edge) and the edge of the frame to help with accuracy. Leave a 1/16-inch border between the edge of the film and the window. Respray the surface of the film and squeegee out any bubbles. Any remaining bubbles that form will be able to escape between the film and the edge of your storm door or window. 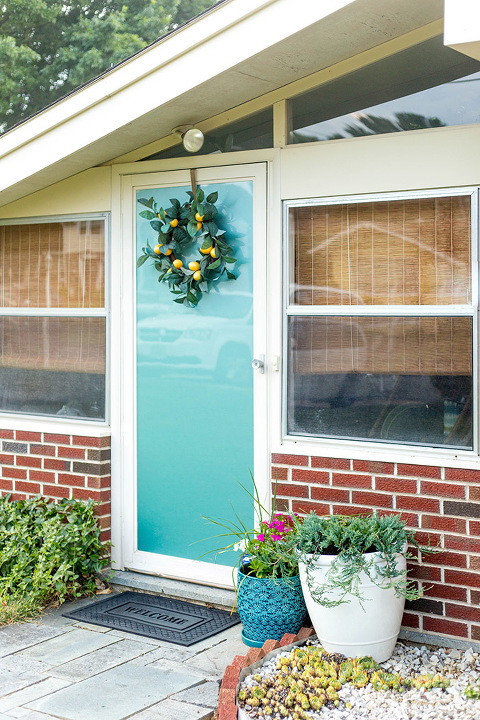 Rehang your storm door in its frame. The film should begin to stick within 30 minutes and normally cures fully in 4-8 days. As you can see from the before and after photos below, this project ended up having major impact—frankly, even more of an impact than I realized it would! Before, the door disappeared into the background of the sunroom behind it, but now the door pops in a big, big way. Plus, it offers us so much more privacy whenever we’re relaxing in the sunroom. The freshly made-over door has caused such a stir in our little neighborhood that I’ve actually gotten calls about how much everyone loves it! In case you’d like to give this project a try in your own home, Astek Home and I are partnering to offer readers 20% off all purchases from www.astekhome.com using coupon code DREAMGREENDIY20. This offer expires August 31 at midnight, so get your order in now, and don’t forget to share your own before and after photos once you’re done so that we can “Ohh” and “Ahh” along with you! Pinned to every single Pinterest board because this project is AQUA and MID-CENTURY – my two favorite things! Everything in my home needs to be one or the other, lol. Love how this turned out! It looks so expensive and that pop of aqua is perfect with your brick. But my storm door is AWFUL and from the outside it hides the aqua door completely.